100% Renewable Energy is sweeping the Kootenays! The Village of New Denver and the City of Rossland have joined the Village of Slocan, the City of Nelson, and the Regional District of Central Kootenay to committed to transitioning to 100% renewable energy no later than 2050. Will Creston be next to say yes to clean energy, green jobs and healthy community? Join your friends and neighbours to find out how you can make a difference and support the renewable energy transition at home in Creston. 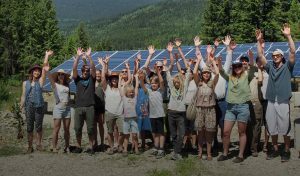 The West Kootenay EcoSociety’s Executive Director Montana Burgess will share progress on the renewable energy transition and have your toolkit so you can help build support for the clean energy transition today. Extreme weather events, like drought, floods, and wildfires are impacting the health and safety of West Kootenay residents, our local economies, and our quality of life. We need the Kootenays to phase-out fossil fuels and transition to 100% renewable energy at the community-level, including electricity, heating and cooling in buildings, transportation and industry, no later than 2050. Stay after the presentation for conversation over a snack or drink at Casey’s.